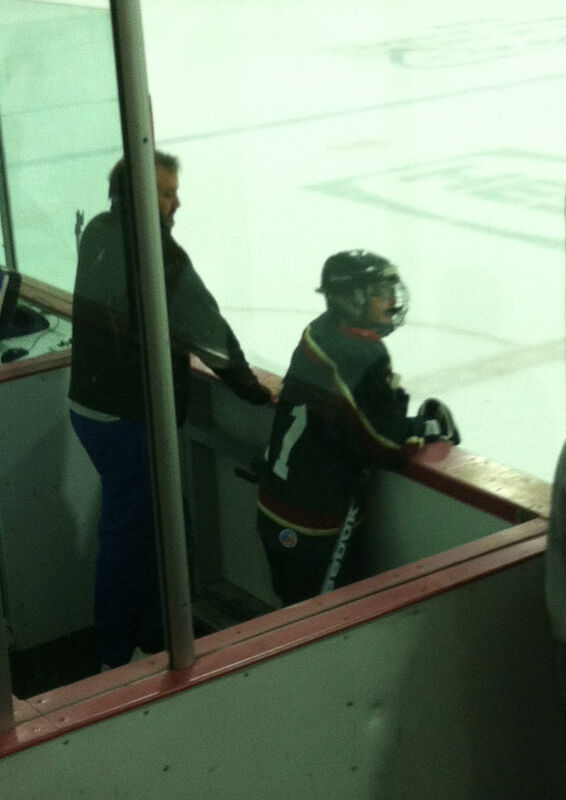 Ryan watches the action from the penalty box. The words were Ryan’s, and they stung. It was Saturday night and he was preparing for bed after a long day that began with a 5 a.m. wakeup to get to, you guessed it, hockey practice. Ryan had been dropping hints all day about a growing disinterest in playing the sport. It was difficult for us to figure out how seriously to take them. He was very concerned about the start time for practices during his holiday break from school. He was up to something — some imaginary Hockey Guys game he wanted to play next Saturday. He asked if he could skip practice. I told him no, as long as he was part of the team, he was counted upon to be at practice. He protested that his skates hurt his feet. I didn’t want to tell him that I’ve been playing for 30 years and my skates always hurt my feet. I tried to encourage Ryan with reminders at how much better he was getting. As we were tucking him in, both Veronica and I pointed out the strengths in his game. He tries hard all the time. He’s always in the right position. I asked him if he’d ever been whistled for offsides. He said no, which is true. He offered that he had never even been called for a penalty. We pointed out that he has become a much better passer. Instead of blindly banging the puck forward, he actually looks up and tries to spot a teammate and get him the puck. After we’d left his room, Veronica and I exchanged a look. We didn’t like the sound of this, but we were still unsure if Ryan was genuinely losing interest in playing or if he was trying to resolve some imaginary conflict with his play schedule for next weekend. Still, that magical two-goal Sunday seemed an awful long time ago. We continued the conversation as we were rushing out of the house at 6 a.m. Sunday to take him to his game. Veronica admitted that Ryan had told her he didn’t want to continue to play because he’s not any good. I was crestfallen. While Ryan is not one of the better players in his league, he’s good enough that he doesn’t stand out for lack of ability. He is not a danger to himself or others on the ice, and he is improving. His statement confirmed that he is aware of how he measures athletically against other kids, and that it bothers him. This was something new, and difficult to process. The game started and Ryan’s team gave up a goal on the first shift. It didn’t seem the day would do much to improve his attitude about hockey. I still hoped this was more about his internal planning for next weekend, but the revelation from Veronica bothered me. Ryan’s team tied it up and the first period ended, 1-1. The team was playing well, and he was giving his all, battling for pucks, trying to make the right pass, and most importantly, driving to the net with his stick on the ice in the offensive zone. After all, that was exactly how he scored both his goals earlier this year. He had a couple of scoring chances in the first, but the puck bounced past his stick each time. Veronica and I both knew how much a goal might do to re-energize his interest in the sport. Early in the second, things bounced his way once again. He was the off-wing on an offensive rush and drove to the net with his head up and his stick on the ice. The opposite winger shot the puck and the goalie made the save, but he kicked the rebound out in Ryan’s direction. Because he was moving forward with his stick in the ready position, Ryan was quickly able to bury the puck before the goalie could come across. Veronica and I jumped up off the bleachers and yelled. We watched Ryan celebrate, arms in the air, screaming for joy and, of course, skating away from his teammates. He yelled two or three more times than probably is appropriate, but we can work on that. It was just great to see him expressing such pure joy on the ice again. There would be no multiple goals on this day, but there was still lots of good. At one point Ryan was poking away at a loose puck in front of the net when the whistle blew to stop play. The defenseman objected and shoved Ryan. It was hardly a major offense — something that would draw nothing more than a “that’s enough” from the referee. But it was the first time I recall anyone acting aggressively towards him, so I watched his reaction with interest. He shoved back, before skating away. Veronica and I were both happy. It wasn’t anything dirty, just a refusal to take being pushed around. In other words, he stood up for himself. It’s a behavior that, as much as I hope he won’t need, I’m awful glad to see him display. Before the game was over, Ryan added another first — he tried to take the puck away from a player on the other team and got his skates instead. The referee’s arm went up. Tripping — his first career penalty. As it happened right in front of us, Veronica and I were able to see, and hear, his reaction. He put his hand up and told the ref, “I know, I did it,” as he skated to the penalty box. I’m pretty sure I saw the official crack a smile. As Ryan anxiously watched his penalty time tick down, his team added a short-handed goal. The penalty was killed off, and he re-joined the action on the ice. Ryan’s team poured it on after his go-ahead goal, cruising to a 6-2 win. 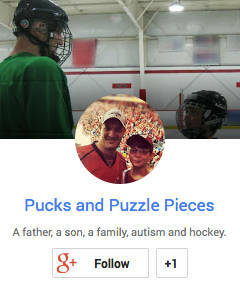 It seems that scoring a goal cured whatever temporary malaise had invaded Ryan’s love of playing the sport. It wasn’t a milestone goal, so there would not be a puck presented to Ryan on this day — at least not by his coach. When we got home, he brought me a puck from his room and asked me to mark the details of the goal on it. I thought about pointing out that it wouldn’t be the actual puck he scored with, but stopped. I just told him I’d get the white hockey tape and the Sharpie. I guess every goal is a milestone goal in Ryan’s mind. And you know what? I think he might just be right. Bravo Ryan! Renewed spirits are a blessing indeed. I don’t know what it says about an Aunt to be happy about her Nephew being in the Penalty Box or pushing another player. I am thrilled. So glad to hear that his Hockey spirit is back, too.